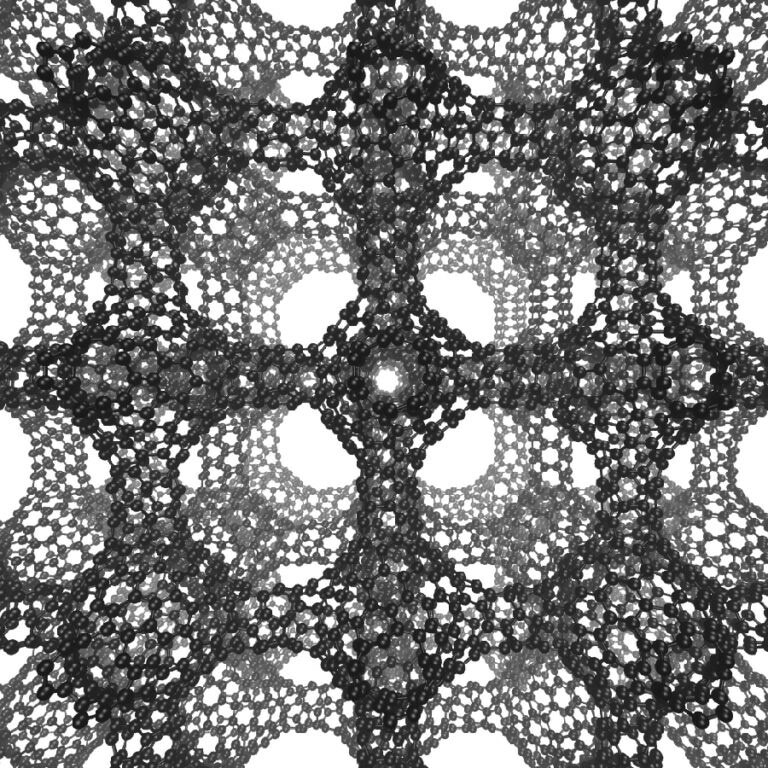 The discovery of buckyballs astonished and pleased chemists in the 1980s, nanotubes enthused physicists in the 1990s, and graphene excited materials scientists in the 2000s, but one nanoscale carbon structure - a negatively curved surface known as a schwarzite - has evaded everyone, until recently. UC Berkeley chemists have shown that three carbon structures lately made by researchers in South Korea and Japan are actually the long-sought schwarzites, which scientists predict will have exclusive electrical and storage properties like those currently being exposed in buckminsterfullerenes (buckyballs or fullerenes for short), nanotubes, and graphene. The new structures were fabricated within the pores of zeolites, crystalline forms of silicon dioxide - sand - more generally used to catalytically crack petroleum into gasoline and as water softeners in laundry detergents. Referred to as zeolite-templated carbons (ZTC), the structures were being inspected for potential interesting properties, though the creators were not aware of their identity as schwarzites, which theoretical chemists have studied for many years. Based on this theoretical study, chemists envisage that schwarzites will have exclusive magnetic, electronic, and optical properties that would make them beneficial as battery electrodes, supercapacitors, and catalysts, and with large internal spaces perfect for gas storage and separation. UC Berkeley postdoctoral fellow Efrem Braun and his colleagues recognized these ZTC materials as schwarzites based of their negative curvature, and formulated a way to predict which zeolites can be used to create schwarzites and which cannot. “We now have the recipe for how to make these structures, which is important because, if we can make them, we can explore their behavior, which we are working hard to do now,” said Berend Smit, an adjunct professor of chemical and biomolecular engineering at UC Berkeley and an expert on porous materials such as metal-organic frameworks and zeolites. Smit, the paper’s corresponding author, Braun and their colleagues in Switzerland, China, Germany, Italy, and Russia will report their finding this week in the journal Proceedings of the National Academy of Sciences. Smit is also a faculty scientist at Lawrence Berkeley National Laboratory. Diamond and graphite are well recognized 3D crystalline arrangements of pure carbon, but carbon atoms can also form 2D “crystals” - hexagonal arrangements patterned like chicken wire. Graphene is an example of such an arrangement. It is a flat sheet of carbon atoms that is not only the world’s strongest material, but also has a high electrical conductivity that makes it a favorable component of electronic devices. Graphene sheets can be bundled up to form soccer ball-shaped fullerenes - spherical carbon cages that can store molecules and are being used nowadays to deliver genes and drugs into the body. Rolling graphene into a cylinder produces fullerenes known as nanotubes, which are being investigated today as extremely conductive wires in electronics and storage vessels for gases like carbon dioxide and hydrogen. All of these are submicroscopic, 10,000 times smaller than the width of a human hair. So far, however, only positively curved fullerenes and graphene, which has zero curvature, have been created, achievements rewarded by Nobel Prizes in 1996 and 2010, respectively. In the 1880s, German physicist Hermann Schwarz explored negatively curved structures that look like soap-bubble surfaces, and when theoretical work on carbon cage molecules increased greatly in the 1990s, Schwarz’s name became linked to the hypothetical negatively curved carbon sheets. Similar to soap bubbles on wire frames, schwarzites possess topologically minimal surfaces. When created inside a zeolite, a vapor of carbon-containing molecules is injected, enabling the carbon to assemble into a 2D graphene-like sheet lining the walls of the pores in the zeolite. The surface is stretched tightly to lessen its area, which makes all the surfaces curve negatively, like a saddle. When the zeolite is dissolved, the schwarzite is what remains. These negatively-curved carbons have been very hard to synthesize on their own, but it turns out that you can grow the carbon film catalytically at the surface of a zeolite. But the schwarzites synthesized to date have been made by choosing zeolite templates through trial and error. We provide very simple instructions you can follow to rationally make schwarzites and we show that, by choosing the right zeolite, you can tune schwarzites to optimize the properties you want. Scientists should be able to pack remarkably large quantities of electrical charge into schwarzites, which would make them superior capacitors than conventional ones used currently in electronics. Their large interior volume would also allow storage of molecules and atoms, which is also being investigated with nanotubes and fullerenes. Their large surface area, corresponding to the surface areas of the zeolites they are grown in, could make them as adaptable as zeolites for catalyzing reactions in the petroleum and natural gas sectors. Braun modeled ZTC structures computationally using the identified structures of zeolites, and partnered with topological mathematician Senja Barthel of the École Polytechnique Fédérale de Lausanne in Sion, Switzerland, to establish which of the minimal surfaces the structures looked like. The team established that, of the approximately 200 zeolites produced so far, only 15 can be used as a template to create schwarzites, and only three of them have been used up to now to make schwarzite ZTCs. More than a million zeolite structures have been predicted, however, so there could be several more possible schwarzite carbon structures made using the zeolite-templating technique. Other co-authors of the paper are Yongjin Lee, Seyed Mohamad Moosavi, and Barthel of the École Polytechnique Fédérale de Lausanne, Rocio Mercado of UC Berkeley, Igor Baburin of the Technische Universität Dresden in Germany and Davide Proserpio of the Università degli Studi di Milano in Italy and Samara State Technical University in Russia. This study was supported by the Center for Gas Separations Relevant to Clean Energy Technologies, a national consortium of researchers guided by UC Berkeley and financed by the U.S. Department of Energy (DE-SC0001015).